The Steve Guttenberg Project: Are you going to eat that sandwich? This is one of the most exciting Gütt films – it’s one of the ones I was actually looking forward to owning. 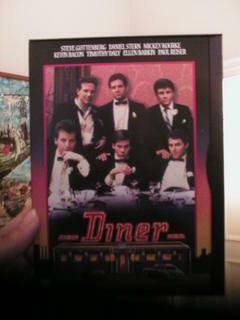 It’s 1982’s Diner! I purchased it in the great Ebay binge of Summer 2005, but since I haven’t been adding to the mission as often as I should, the delightful Alexcia brought me a copy on DVD. See you later VHS copy! For those of you not familiar with this classic film (and you all should be, so go and rent it immediately if you haven’t seen it already), it’s set in Baltimore in the late 50’s. The Gütt plays Eddie, one of six friends who hang out at a diner (hence the title) in Baltimore. The movie’s not really about anything. It’s more the relationships between the guys, and their girlfriends/wives. But not in a pukey, sappy way. Steve’s character Eddie has one of the classic moments in the film – he gives a football (for you Brits, that’s American football, not soccer) quiz to his fiancée two days before his wedding. If she fails, the wedding’s off. Clearly, this guy is a keeper. This film has some of my favourite movie dialogue of all time. I can’t think of another movie that captures the way friends really talk to each other – it’s full of conversations that don’t advance the plot or serve any purpose other than being hi-freaking-larious. This one may be my favourite. And, of course, it features the Gütt. MODELL (to Eddie): What's that, roast beef? EDDIE: Don't ask me this anymore, Modell. Yes. EDDIE: Yeah, I'm gonna finish it. I paid for it; I'm not going to give it to you. EDDIE: What do you want?! Say the words. MODELL: No,...if you're gonna eat it, you eat; that's all right. EDDIE: Say the words: "I want the roast-beef sandwich." Say the words, and I'll give you a piece. It’s also a film that’s chock full o' future stars. It co-stars Kevin Bacon (in his first major role), Ellen Barkin (in her first film), Daniel Stern (first major role), Mickey Rourke (before he became a scary plastic man), Paul Reiser (in his first film), Timothy Daly (ditto), and of course, the Gütt. Amusingly, at the time, Steve was the actor with the most experience. And, of all the cast, has he gone on to the most illustrious career? I’ll leave that for you to decide. The DVD has the added bonus of a documentary featuring interviews with all the cast, and director Barry Levinson. It’s very enjoyable, made even more so by the tantalizing absence of Mickey Rourke and several veiled comments to arguments and stress amongst the cast. Could Mickey Rouke be involved in a 20 year feud with the Gütt? We can only hope so! What Kind of Pre-Trade-Show Marketing and Post-Trade-Show Follow-Up Marketing Should Your Company Do? Going to a trade show without advance preparation is a waste of time and money ... Blogs are relatively new and entrepreneurs and corporations alike are just now starting to experiment with using them .